From the Cumberland Gap to the Atlantic Ocean, this is Virginia Water Radio for the week of May 26, 2014. This week, we feature a series of guest voices calling out a mysterious group of names. Have a listen for about 25 seconds, and see if you can guess who—or rather, what—these names might be. If you guessed hurricanes, you’re right! Those are the names planned for hurricanes and tropical storms during the 2014 Atlantic tropical storm season, covering the Atlantic Ocean, Gulf of Mexico, and Caribbean Sea. The season runs officially from June 1 through November 30, but exceptions happen, such as in 2012 when the first two named storms occurred in May. National Hurricane Preparedness Week is May 25 to 31, and during that same period Virginia is offering its annual sales-tax holiday for hurricane-preparedness supplies and equipment. Hurricanes and tropical storms are two categories of tropical cyclones—counter-clockwise-rotating storm systems that start in tropical or sub-tropical latitudes. A tropical cyclone is called a tropical storm—and gets a name—when sustained wind speeds reach 39 miles per hour; at 74 miles per hour, a tropical cyclone is considered a hurricane. Tropical depressions—with wind speeds below 39 miles per hour—don’t get names, but they can still bring heavy rainfall and flooding. Before a tropical system of any speed or name barges into the Old Dominion, you can get ready by making an emergency plan, including an evacuation plan; assembling an emergency kit of food, water, and supplies; and establishing ways to stay informed, especially if the power goes out. Detailed instructions are available from the Virginia Department of Emergency Management, online at readyvirginia.gov. Thanks to friends in Blacksburg for lending their voices to this episode. 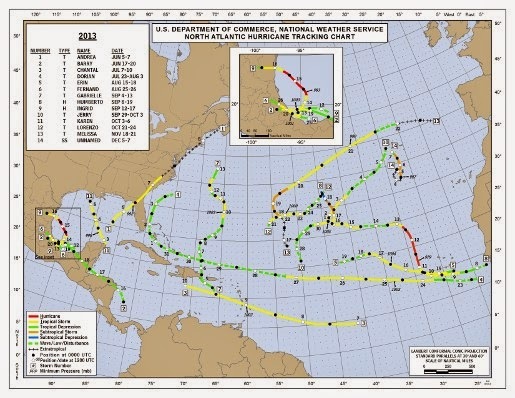 Names and tracks of 2013 Atlantic tropical storms, according to the National Hurricane Center, online at http://www.nhc.noaa.gov/2013atlan.shtml (accessed 5/23/14). Thanks to the Blacksburg, Va., residents who recorded tropical storm names for this episode on May 22, 2014. Following are the planned names for storms in the 2014 Atlantic tropical storm season, according to the National Oceanic and Atmospheric Administration’s (NOAA) “Tropical Cyclone Names” Web page, http://www.nhc.noaa.gov/aboutnames.shtml: Arthur, Bertha, Cristobal, Dolly, Edouard, Fay, Gonzalo, Hanna, Isaias, Josephine, Kyle, Laura, Marco, Nana, Omar, Paulette, Rene, Sally, Teddy, Vicky, and Wilfred. Tropical-storm-season preparedness was also featured in Virginia Water Radio Episode 163 (5-27-13). National Hurricane Center, online at http://www.nhc.noaa.gov/; this site provides bulletins, maps, and other information on tropical storms as they are occurring. Data archives for past seasons are available at http://www.nhc.noaa.gov/data/. National Oceanic and Atmospheric Administration (NOAA), “NOAA predicts near-normal or below-normal 2014 Atlantic hurricane season,” 5/22/14 news release, online at http://www.noaanews.noaa.gov/stories2014/20140522_hurricaneoutlook_atlantic.html. The full Atlantic hurricane outlook, providing more details than the news release, is available from the National Oceanic and Atmospheric Administration’s (NOAA) Climate Prediction Center, online at http://www.cpc.ncep.noaa.gov/products/outlooks/hurricane.shtml. National Weather Service, “What is a Tropical Cyclone?”; online at http://www.nws.noaa.gov/os/hurricane/resources/TropicalCyclones11.pdf. Virginia Department of Emergency Management, “Hurricanes,” online at http://www.vaemergency.gov/readyvirginia/stayinformed/hurricanes. Details regarding Virginia’s Hurricane Preparedness Sales Tax Holiday can be found at http://www.vaemergency.gov/readyvirginia/stay-informed/hurricanes/sales-tax-holiday. Virginia Department of Transportation, “Hurricane Evacuation Guide,” online at http://www.virginiadot.org/travel/hurricane_defauLT.asp.